Melt butter in a pan, add oil and heat through. Add the ham, onion and garlic. Saute until the onion is soft and translucent, about 5-8 minutes. Sprinkle with flour and spices and cook 1-2 minutes. Add the milk and cook, stirring occasionally, until the mixture thickens. Place in a covered container and refrigerate at least 1 hour and up to 8 or until firm. Heat 1/2 inch canola oil in a large skillet. Place the egg and breadcrumbs/matzo meal in separate shallow bowls. Form the dough into 2 inch by 1/2 inch logs. Dip in egg then dredge in crumbs. Fry, turning once, until golden, about 5 minutes. Drain on paper towel lined plates. Serve immediately. *I diced leftover sliced ham so my "cubes" were on the flatter side. Whole or sliced (not deli) ham would work. **I actually used some egg yolk leftover from making macarons but either would work. 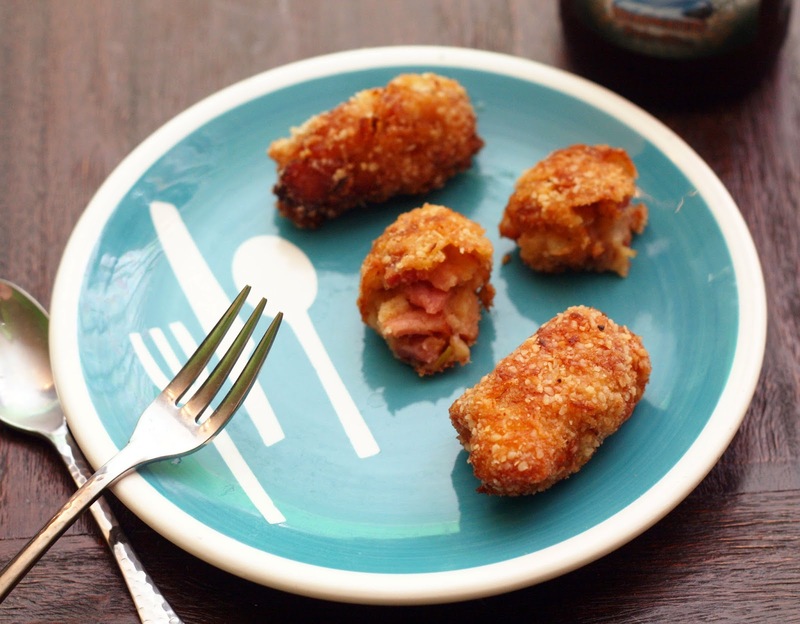 Why don't we eat more croquettes in this country? When we were in Belgium, I ate a ton of croquettes aux crevettes (shrimp croquettes) and in planning our upcoming trip to Portugal, it looks like Lisbon is lousy with beef croquettes (croquetes). Occasionally we might make a fish cake but they aren't as fun as the little log-shaped croquettes that are so abundant elsewhere. I'd like to change that. I made these using leftover spiral-sliced ham and just onion and garlic but they were super flavorful and surprisingly easy. When we went to a cooking class in Brugge, the chef showed us how to make croquettes aux crevettes but he had a big pan of flour and milk paste ready to go so all you needed to do was scoop some out and mix in the shrimp. That really isn't practical for the home cook so I came up with this recipe which makes the "paste" on the stove trapping the ham inside. The croquette is a delight; crisp on the outside, melty and warm on the inside.